Become a Shareholder in the World’s First Community-Supported Journal! To further its transformative impact, JAFSCD has become open access — freely available worldwide. To this end, we have modeled our open access campaign on a model familiar to those involved with food systems—community supported agriculture—to become the world's first community-supported journal. Ongoing funding to support open access comes from the sale of annual OA shares, our four founding partners, and ongoing support from libraries. We are asking allied programs, organizations, groups, and other entities around the world to purchase shares annually, joining the JAFSCD Shareholder Consortium. We have developed the community-supported journal publishing model in response to the growing need for affordable and equitable research-based information in support of the good food movement. The benefits to shareholding member groups are outlined below. Creating an outreach and impact program, increasing our social media presence and sending out press releases for each paper to wire services, green alternative media, and food and farming listservs. Reaching out to scholars and practitioners working in communities of need to encourage them to use JAFSCD content and consider publishing with JAFSCD. Bolstering our outreach to HBCUs, Hispanic-serving institutions, and Tribal colleges and universities to encourage use of and publishing with JAFSCD. Developing an author mentor program for new scholars and nonacademic authors to maximize their chances of having a paper accepted for publication. 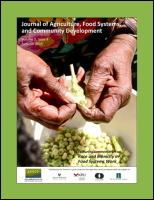 Expanding our JAFSCD Food Systems Research, Policy, and Practice Briefs series (two-page summaries of papers that provide a quick read for busy food systems professionals and policy-makers). Supporting our open access publishing platform hosted by the Public Knowledge Project, which increases JAFSCD's discoverability through Google Scholar and other sources. Purchasing an annual subscription to Altmetric to measure JAFSCD's reach into communities of need via social media such as tweets, blogs, mentions, downloads, etc. Expanding our Consulting Editor Program that assists non-native English speaking authors. Creating a free index of open access research papers on food systems to aid practitioners in finding research-based material to support their work or funding proposals. Conducting an annual survey of our authors and nonprofit stakeholders to gather stories on how JAFSCD is assisting in their work. Supporting the long-term preservation of JAFSCD content through LOCKSS. Free premium listing in the Sustainable Food Systems Sourcebook ($375 value), an online directory of academic programs, nonprofit groups, funders, and other resources related to food systems. The Sourcebook will increase the visibility of your program among students and practitioners — and you can update your listing throughout the year. Article Publishing Charge is waived: The JAFSCD APC of $500 is waived for all authors affiliated with the shareholding program, including all faculty, staff, and students of the host institution. Free advertising. Shareholders can advertise for free on the JAFSCD website, including promoting a publication, book, job opening, or technology. We are using the Creative Commons license CC BY 4.0. This license helps maximize JAFSCD content distribution by allowing readers to copy, redistribute, and build upon the material for any purpose, even commercially, as long as they give proper attribution. Shareholder acknowledgment on each issue's tables of contents (both online and in PDF) and throughout the JAFSCD website. Membership in the JAFSCD Shareholder Consortium, which will provide input on editorial policy and topics for special issues, and whose members complete an annual survey on the content and impact of JAFSCD. Contributing an annual commentary on food systems development research, policy, or practice (one per consortium shareholder) to the consortium that is published in the JAFSCD. The JAFSCD Shareholder Consortium will provide input on editorial policy, special topic calls for papers, and shareholding members can submit an annual commentary that will be published each year. We aspire to have a Shareholder Consortium that is culturally diverse and international, with at least one shareholding entity from each U.S. state, Canadian province, and U.S. and Canadian territories. We encourage shareholders to represent their states or provinces in the consortium to the extent they are able, serving as a liaison or conduit for all their good food and farming organizations and research initiatives. This will give the consortium broad geographic representation and also serve as a networking and sharing opportunity at this broad level. If resources are limited in a state or province, several entities can consider teaming up on a group share. They would then also team up to represent their state or province's good food and farming work. Read details on group pledges and shares below. * We will not limit participation to entities based on their ability to purchase a share. Prospective Consortium members can pay any amount they deem fair and find affordable.